This was the scene along Almond Creek Drive as homeowners in Clear Lake’s Bay Oaks subdivision awaited pickup of their debri after flooding from the rains of Hurricane Harvey. It will be awhile before we hear raindrops and don’t tense up after our lives were turned upside down by a hurricane named Harvey that couldn’t seem to make up his mind where to go next. And also managed to drop nearly 52 inches of rain and leave behind billions of dollars in damages. While it may be months before exact figures are available, we do know that approximately 136,000 area homes were damaged – 113,000 in Harris County and about 23,000 in nearby Galveston County as many creeks and bayous filled to capacity and then began filling nearby homes and businesses. Two Bay Area mayors’ homes were among the victims. Some cities were lucky. Others not so. Among the hardest hit were League City, Friendswood and Dickinson as Clear Creek spilled out of its banks and into homes, along with tons of rain. Please note: figures are best estimates. Baytown was another area city hard hit by Harvey with more than 4,000 homes flooded and about 1,000 of those families having to ask for help. Nearby, the $6 billion Chevron Phillips Chemical expansion has been delayed until next year after Harvey floodwaters created problems that will take a few months to resolve. Also, Exxon’s Baytown facility lost its roof due to the heavy rain – one of 10 refineries knocked offline by the storm. An estimated 250 homes flooded in the Clear Lake City area according to Houston officials, who said homes in Bay Oaks, Bay Glen, Bay Pointe, Meadowgreen, Oakbrook West, Pine Brook, Middlebrook, Brook Forest, University Green, Sterling Knoll, Pipers Meadow and Northfork reported water damages – some with only an inch or two of water and some with a foot or so as Horsepen Bayou overflowed. This Exxon station near the intersection of El Camino Real and NASA Parkway in Clear Lake felt the wrath of Hurricane Harvey as he came sweeping through the Bay Area. Mayor Pro-tem Amanda Fenwick did not have exact figures but said the small community of Clear Lake Shores, which sits right on the water, was not spared. From 75 to 100 homes took on water, as did about a half dozen businesses. 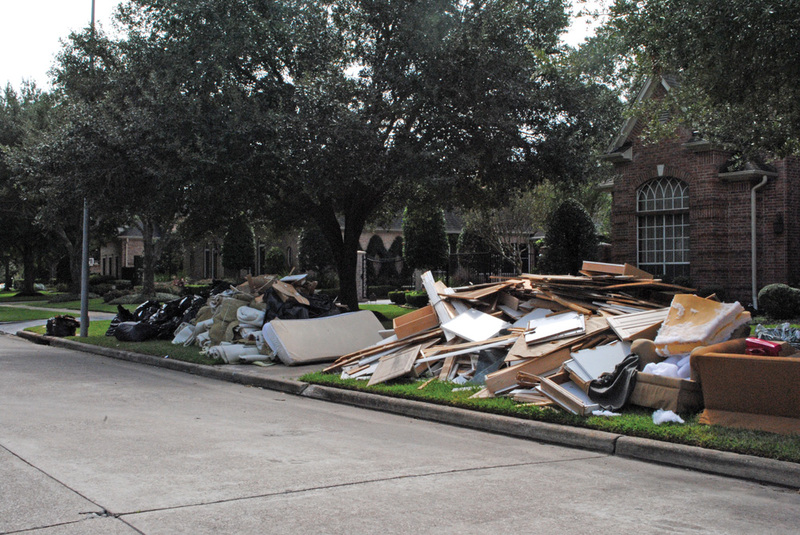 League City neighbor, Dickinson, was another of our suffering cities with an estimated 7,376 homes and 88 businesses – 50 percent with major damage — nearly drowning in Harvey’s onslaught, including the home of the mayor. About 90 percent of the city was underwater at the height of the storm, we’re told, with at least half of the city’s 20,000 population now trying to dry out. Mayor Mark Briggs of El Lago says his little city wasn’t spared either, with about 90 homes damaged as the unending rain fell and nearby Taylor Lake filled to overflowing. This city suffered major damage as Clear Creek raced out of its banks and into some 3,000 homes – including single-family dwellings, condos and apartments. As the waters rose and electricity was lost, hundreds had to be rescued and taken to shelters set up at Friendswood High, Wedgewood Elementary, Calvary Houston Church and the Friendswood Activity Building. Approximate 80 businesses also were flooded or suffered wind damage, including the Galloway School, which took in about 2 feet of water. While Kemah didn’t have any catastrophic damages, an estimated 48 structures were damaged during the hurricane – 20 in Kemah Oaks, 15 in South Kemah, 1 in Kemah Village, 3 in West Kemah and 9 on the east side of Highway 146. None met the 50 percent threshold. To help its residents, the city and the Kemah Community Development Corp.welcomed disaster recovery experts to a Business Alliance meeting — Rick Larson with FEMA and David Reetz with SBA – who shared information about resources available to business owners for assistance with recovery from both physical damage and financial loss due to declines in business revenues. Mayor Carl Joiner said, “It is important for us to join together as a community and support our local business owners,” going on the thank T-Bone Tom’s owner, Barry Terrell, and General Manager Jeff Sauerwein, for opening the restaurant early to host the Business Alliance Meeting. This pretty city surrounded by Clear Lake, Lake Nassau and Nassau Bay, which turns into Clear Creek as it heads toward the Gulf of Mexico, got soggy again after its recovery from Hurricane Ike not so many years ago. Mayor Mark Denman reports that 154 homes (about 10 percent of the homes) took on water, but no businesses were damaged. Taylor Lake Village had only a small number of homes damaged by rising water, Mayor Jon Keeney said, just 19 of its 1,400 homes were the victims of rising water from Taylor Lake and/or severe wind damage. Compared to some areas, “Webster was very fortunate,” Economic Development Specialist Karen Coglianese says when asked about damages to the city. A total of 111 single family homes and 154 multi-family dwellings had minor damages, she explained. Some 75 businesses had minor damages. However, 2 businesses were not so fortunate, suffering major damage. And, our recovery is far from over. Just the other day more than 150 people, including students, college employees and members of the public attended one of two assistance fairs at College of the Mainland in Texas City, taking the opportunity to answer questions remaining about assistance for victims of Hurricane Harvey. Representatives from FEMA and other public and private assistance organizations helped direct people to appropriate assistance and information. Attendees also had a chance to meet directly with members of the FEMA Disaster Survivor Assistance Team.